Here is a list of best free Oscilloscope Software for Windows. These software work as CRO software on your PC to analyze signals and sound. If you are on low budget and cannot afford an oscilloscope, then these PC oscilloscope software will come in handy. The following software have been tested for sound signal input via 3.5 mm audio input jack of my PC. You can also analyze other signals from circuits or devices using these free CRO software. But this requires a specific hardware setup, which you can checkout here. Now let us see what these Spectrum analyzer software have to offer. 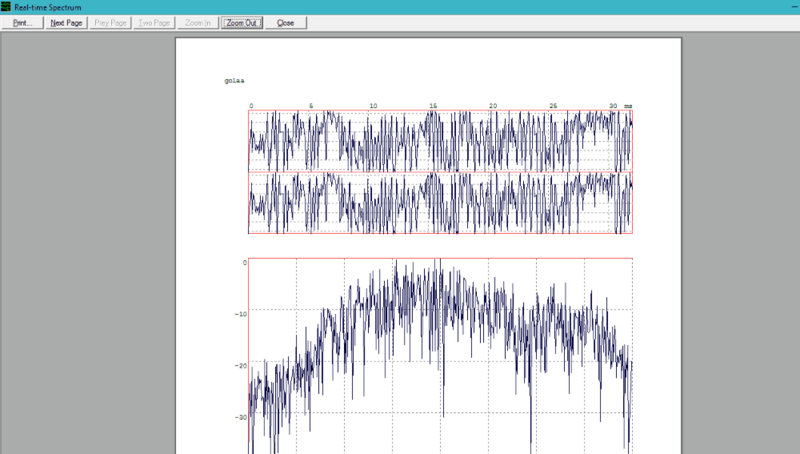 Once these software start to read input signal, you can view signal spectra for both or either of the two channels. Most of these software also provide FFT waveform viewing mode. While some of these software are just audio spectrum analyzer software, some provide extensive signal details. You can measure frequency, peak voltage, crest factor, ZRLC, phase, etc. One of these oscilloscope freeware provides Filter option, where you can apply different FIR filter to signal input and then analyze the signal. You will also find Signal generator tool with some of these software. As you will go through the list, you will get to know about the features offered by them. There are several important features listed below, which will help you select the one suitable for you. I like Visual Analyser the most. It has numerous tools and options that will help you with signal analysis. You can not only view the signal waveform, but find out values of frequency, peak voltage, ZRLC, and much more. Know more about this free CRO software below. You can also checkout the list of best free Circuit Design Software, CAD Software, and Unit Converter Software. Winscope is a free oscilloscope software that can be used to analyze any signal on your computer. When you input a signal, it lets you view its signal spectrum, measure frequency, plot Lissajous patterns, view FFT spectrum, save signal data, and more. It reads signal input via the 3.5mm audio jack of your computer. Trace Modes: There are three spectra trace modes available. These are YT Single Trace, YT Dual Trace, and XY Mode. View spectra in Line plot or Scatter plot. FFT Mode: Transforms the input signal to display amplitude vs time spectra in amplitude vs frequency spectra. Correlometer option is also available. 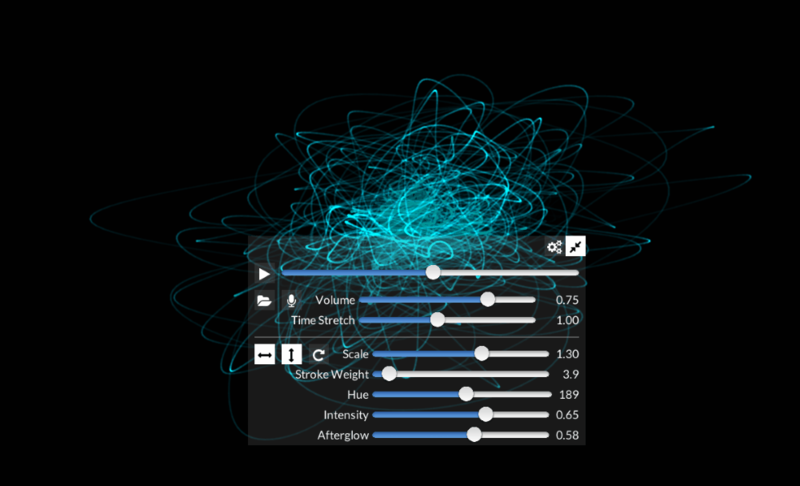 It lets you find the correlation between two sound sources. Save signal analysis data in DAT format to your computer. There are various other options that you can use here. Set the oscilloscope display positions, set trigger point, set delay, etc. You can also change spectra color for different traces. Visual Analyser is another good oscilloscope software for Windows. It is an extensive oscilloscope software with signal spectra analyser. Also, you will find lots of tools to view signal related data, find out values of various parameters, measure frequency, apply filters, and much more. There are two signal spectra viewers on this Oscillosope; one displays the usual signal spectra, while the other displays FFT spectra of the signal. On the left hand side of the interface, you will find options to change the spectra viewer parameters. You can change the zoom factor, ms/d value, positions of X and Y plots, etc. Certain values, such as: frequency, mean value, crest factor, peak voltage, ZRLC, phase, channels, etc. can be found out here. Options to capture scope or spectrum are also available. The best thing about this tool is that it is an oscilloscope software with filters. You can apply various filters on the input signal, then measure values and view spectra. Set different filters for Channel A and B. Preloaded filters available are: FIR low pass, FIR high pass, FIR band pass, FIR band reject, and IIR Notch. You can also apply custom FIR filters. Its an extensive oscilloscope software with tools to analyse signals thoroughly. Soundcard Oscilloscope is a feature rich oscilloscope software which is free for personal use only. Its an oscilloscope software with signal generator and various other tools. The signal input is displayed on the interface. You can change the spectra plot parameters to view and analyze the real-time signal spectra carefully. Set the channel amplitude for both channels separately or keep the channels synced for common channel amplitude. Set time scale from 1 minute to 10 seconds. You can also set channel modes as: single, CH1 – CH2, CH1 + CH2, or CH1 x CH2. Signal measurement tools to find out frequency and voltage are also available. Real-time values are displayed right on the spectra screen. Other tools are available in respective tabs. View the XY graph or view the frequency graph. Signal Generator tab lets you generate signal manually. You can generate custom signal for channel 1 and 2. Generate sine, triangle, square, sawtooth, pink noise, or white noise. Set signal amplitude, frequency, etc. The output of the signal generator can be heard on the speakers connected to your PC. Generated signal can also be recorded on your PC in WAV format. Oscilloscope is a free oscilloscope software which only displays the XY spectra of a signal or audio file. You cannot analyze a signal, but only view its XY spectra. You can either input a signal through 3.5mm audio jack, use your PC’s mic, or simply select an audio file from your PC to view its waveform. It is a pretty simple software and has not much practical use. It has been developed to enjoy the waveforms of audio songs. I loaded a song from my PC and this is how the waveform looked like (see above image). The options available let you change waveform scale, strole weight, hue (color), intensity, and afterglow. 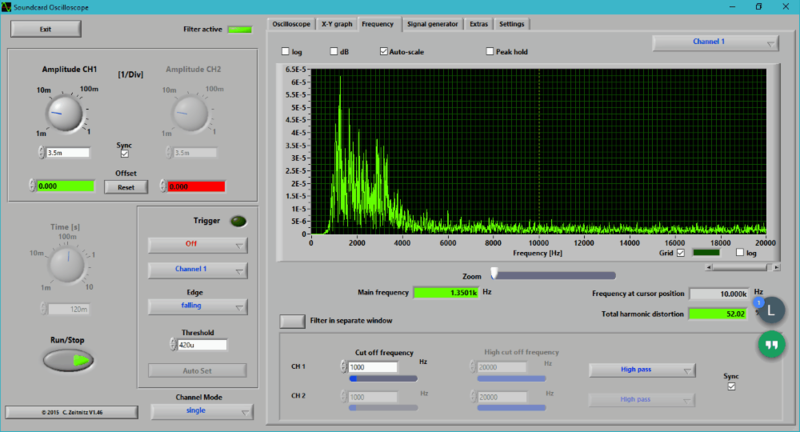 Frequency Analyzer is another simple oscilloscope software which displays real-time sound waveform. It takes audio input from mic connected to your PC via sound card and displays real-time signal spectra. You can also analyze an audio file in WAV format or a BMP file. 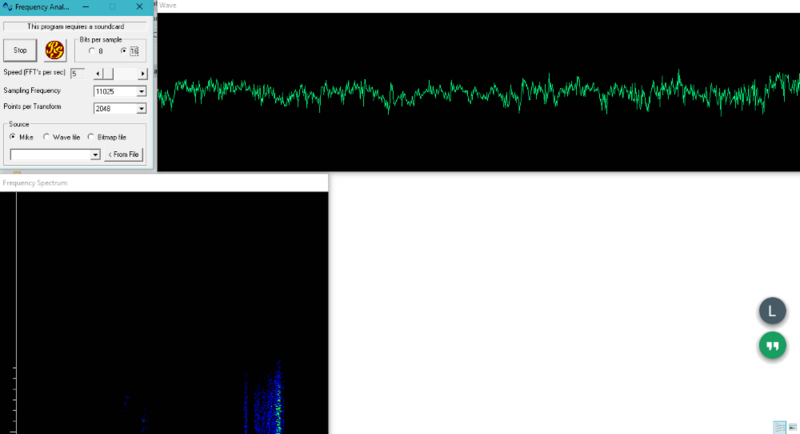 Along with the Signal Waveform, another window displays Frequency Spectrum of sound signal as well. The configuration options let you change waveform scales and parameters. You can choose to select from 8 or 16 bits per sample, FFT speed, sampling frequency, and points per transform. You will not find any other options here other than sound waveform and frequency analysis. Real-time Spectrum, as the name says, displays the real-time spectra of input signal. This oscilloscope software displays real-time waveform and FFT waveform of signals. It detects signal from 3.5 mm audio jack of your PC. The options available here let you select if you want to view waveform of Left, Right, or both channels. Select graph type from: Cepstrum, Smoothed Spectrum, Filterbank, or Auditory Filterbank. You can also set max. frequency, frame rate, and dynamic range of the graph. If you want to take out the printout of an instance, pause the waveform and select the Print option. Click on the above image to view how the printout looks like. 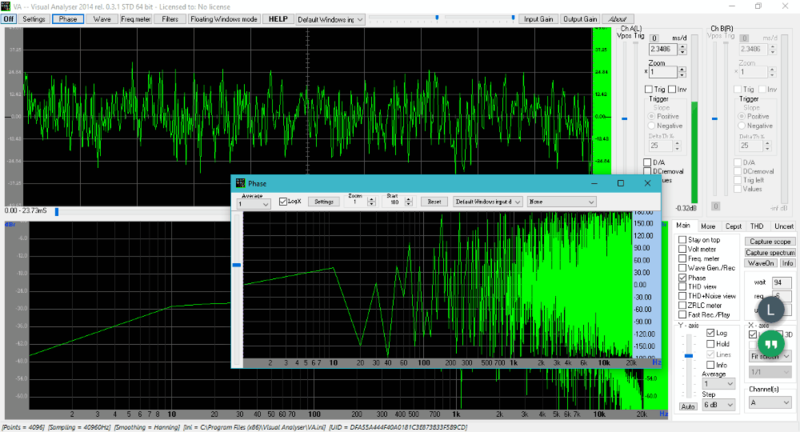 AUDio MEasurement System is a free oscilloscope software for Windows. This oscilloscope software comes with a signal generator, spectrum analyzer, and frequency response measurement tool. During testing, I found out that it didn’t take signal input from the sound card, but from USB mic. The oscilloscope scale parameters can be adjusted to analyze signal. You can change values of X scale, left and right channel v/div, offset, and trigger edge. It is a really easy to use oscilloscope that can be used to analyze signal waveform. Each of these oscilloscope software were installed and tested, but didn’t work because of the lack of the signal input.